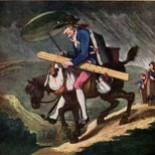 This article offers a new identification for a watercolour exhibited in the recent ‘Turner et la Couleur’ exhibition at the Hotel de Caumont, Aix en Provence 4 May – 18 September 2016 and afterwards in ‘J M W Turner: Adventures in Colour’ at Turner Contemporary, Margate, 8 October 2016 – 8 January 2017. Its title at the exhibition was ‘River Scene: Moonight (formerly called Rolandseck)’. It was lent from a private collection and it is possibly the first time (at least in my experience) that it has been exhibited. Exhibited Aix en Provence ‘Turner et la Couleur’ (no.105) and Turner Contemporary, Margate, ‘JMW Turner: Adventures in Colour’ as ‘River Scene: Moonlight’, the subject can here be reidentified. Image scanned from catalogue ‘Turner et la Couleur’, 2016, no.105, pending approval of the owner. The subject can here be identified as a view of The Castle of Ehrenbreitstein looking up the Rhine from Neuendorf, with the church of St Peter in the foreground. St Peter’s has been completely transformed since Turner’s time. The gothic-style hall that he saw was begun in 1723, but completely rebuilt on its north side in 1913, enlarging the floor area to three times the original size and adding a large neo-Baroque tower. Besides the redevelopment of the church, the riverbanks have been reclaimed and built upon, so that Turner’s exact viewpoint is now under houses. The wisdom of building on the waterline has been severely tested by floods over the years to the extent that major works took place on the shore recently to build flood defences. Despite having lunch in a restaurant very close to the church on a cycle tour from Mainz to Bonn in 2006, I am disappointed to discover that I appear to have taken no photographs. All I can imagine that my companions diverted me from Turner duty with bonhomie, beers and fine German fare. Well perhaps in truth not so much of the bonhomie. Still, I would look forward to an opportunity to return one day. Luckily for our immediate purposes the construction company that built the flood defences have a very close comparison on their web report of the project. 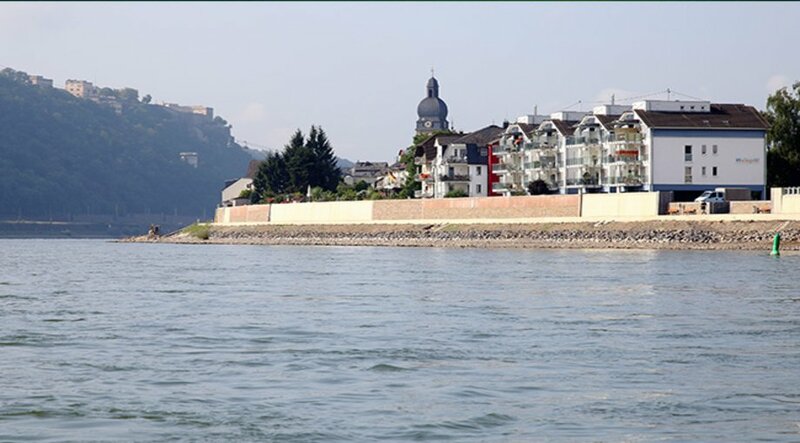 Neuendorf, looking up the Rhine with St Peter’s Church in the foreground and Ehrenbreitstein Castle in the beyond. Turner’s church was comprehensively rebuilt in 1913, but the view of the castle is pretty much unchanged. Photograph by courtesy of Björnsen Beratende Ingenieure of Koblenz. To see the image in the company’s website click on the following link, and use your browser’s ‘back’ button to return to this page. The site is worth visiting for a full picture of the works undertaken. My identification of the watercolour is in fact more of a re-identification. In 1902 Sir Walter Armstrong produced the first comprehensive list of Turner’s watercolours including one, on p.252 given as “Ehrenbreitstein” 1835-40. [J P Heseltine, Esq.] 8 1/2 x 11. Church on low promontory of river, across which rises the Castle bluff. Late blue sketch on white paper’. This is otherwise unaccounted for today, but was listed by Andrew Wilton in his 1979 catalogue of the Turner’s watercolours as no.1320 ‘(?) Ehrenbreitstein c.1840. Watercolour 229 x 280 (sight). Prov: J P Heseltine; Sotheby 28 June 1944, bt Willoughby; Sir Thomas Barlow. Coll; untraced [not reproduced].’ According to Ian Warrell in the Aix en Provence catalogue (no.105) the watercolour had at some stage acquired the identification of Rolandseck, which is some way further down the Rhine, but this was discounted by Warrell in favour of the generic ‘River Scene: Moonlight’. Given my avowed interest in Turner’s observations from nature, the effect and time of day is perhaps worth a little consideration. The view looks almost due south and although conditions are blue and bosky, the landscape is suffused with misty light. The church is lamp black in the foreground before the ultramarine bluff of Ehrenbreitstein. The castle is contre-jour against a distinct lightening of the sky from the distant left. The source catches the high cirrus brightly in mackerel flecks and bars, whilst warming the right hand side of the picture. Rather than moonlight (and regular readers will know that I am generally keen to prove a moonlight!) this seems to me much more the effect of dawn. The lamp black foreground splendidly transmitting the still chilled riverside, in the deep shade of the eastern bank of the river, before any of the coming light has yet touched it. 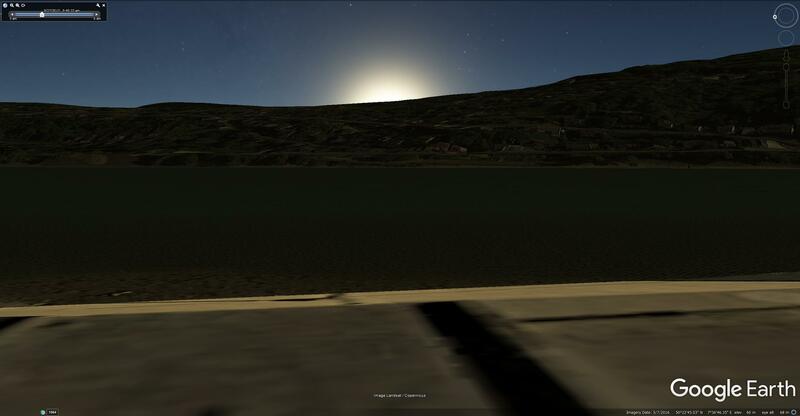 In the right foreground already on river boatman is abroad, another lucky witness to the brilliance of the early hour. 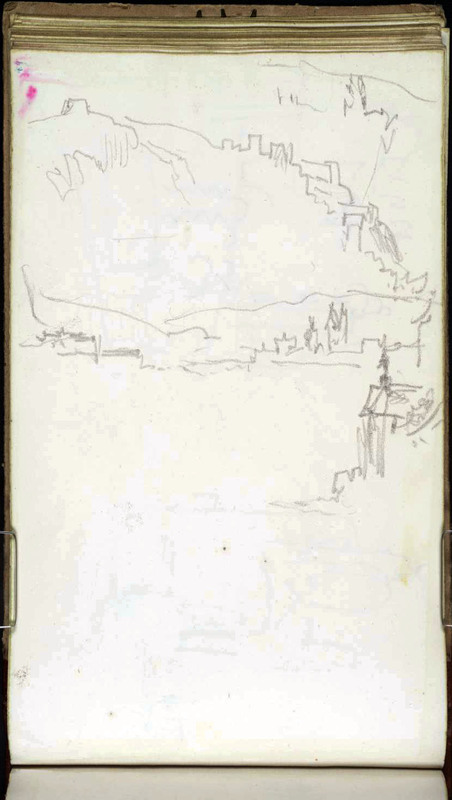 There are some sketches in the Turner Bequest that record Ehrenbreitstein from a similar angle, but only one of the identified subjects comes at all close to the present subject. This is a three-part sketch of Ehrenbreitstein looking up the Rhine, with the castle in the top (left) register, the towers of Koblenz to the right in the second register, and the apse of St Peter’s church, Neuendorf closing the scene in the third (extreme right) register. 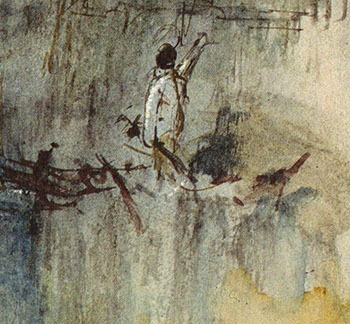 The present watercolour revisits almost the exact viewpoint of the sketch, but belongs to a visit in the early 1840s, when Turner passed through Koblenz on several occasions, whilst journeying up or down the Rhine by steamboat on his way to Switzerland and the Alps during successive tours 1840-44. Earlier articles on SublimeSites.co have considered his work at Heidelberg in this period, but the present subject seems to stand as a foil to a study of the Mosel Bridge, Koblenz, with Ehrenbreitstein beyond, Sunset (Tate CCCLXIV 286; D36139) which in turn formed the basis of a finished watercolour of 1842 at Cincinnati Art Museum. The latter was thought by many to be a copy of a lost Turner, and reproduced as such by Ian Warrell in ‘Through Switzerland with Turner’ (Tate, 1995, p.43). I was lucky to see the watercolour on a trip to Cincinnati in 2001, and was straight away convinced that it could only be by Turner. I was not the first to think so. Eric Shanes had left a note in the Museum files to that effect. I wrote a long note to Cincinnati making the case for its authenticity, and rather disappointingly never even received so much as an acknowledgement. So shortly afterwards I sent the material to Andrew Wilton and he included it in his exhibition ‘Turner, Licht und Farbe’, no.178, with a note accepting it as the original. To return to the present example, it seems plain that on his tours of the 1840s (and earlier, as I have contended elsewhere) Turner devoted himself to recording hundreds of extremely particular effects directly in watercolour. Quite what the occasion of the present subject could have been, however, requires a little speculation. 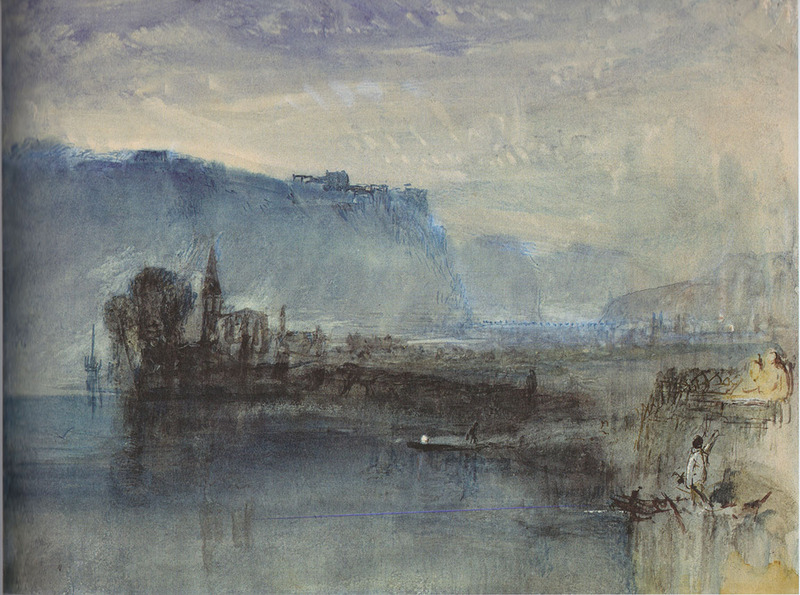 Turner passed through Koblenz on most of his visits to the Alps in the 1840s, but stylistic features – particularly the handling of the sky – compare closely with the Mosel Bridge sketch and watercolour suggesting a date of date of 1840 or 1841. 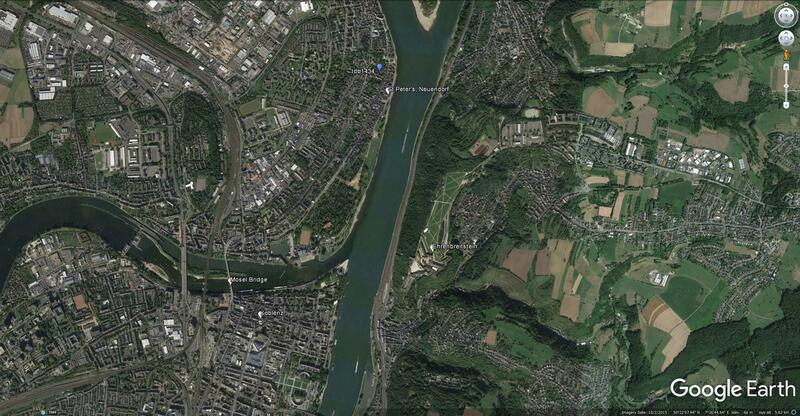 Turner would have stayed in Koblenz and Neuendorf is no more than a decent walk away from the city centre, but it seems unlikely that even he would have got up before dawn to walk out here on the off chance that the effect might have been worth seeing. We know that Turner passed through Koblenz on his way home from Venice in late September 1840. In the present composition we are looking due south and on 27 September (for example) the sun first broaches the horizon slightly behind us to the left at 05.45 GMT, and in the watercolour it does appear as if the first rays are catching the boatman at the bottom right corner of the composition. So what might have been the precise circumstances of the watercolour? The steamboat for Cologne and all stops downstream on his way back to London would presumably have left Koblenz at first light, so here is Turner, just embarked, out on deck to witness the sun coming up as his boat slips away downstream. Under such circumstances he might easily have begun the watercolour direct from nature, and had the time, leisure and circumstances in which to carry it to a reasonable degree of elaboration as the journey unfolded. What a wonderful watercolor! Turner first encountered the Ehrenbreitstein on his 1817 tour– now in its bicentenary. He seemed entranced by the slope-shouldered fortress and returned to this motif many times in his sketchbooks while on tour, as well as in his oil painting. Like the late Rigi watercolors, the form of the fortress seemed to provide a template within which he could play with color and light effects as refracted by the humid atmosphere or river mists. Degas made a number of pastels of ballerinas and women combing their hair in his late period in which he used the same line form as a template for a variety of color compositions. With your inspiration, I now have a wordpress blog. I have corrected the date when Turner returned to Farnley as September, 1817, not November, as printed in the Turner in Yorkshire catalog from back in the day. Cheers. Would be great to see you again. C’est bien tardivement que j’ai pris connaissance de cette nouvelle identification d’une aquarelle de Turner par l’auteur des « Sublimes sites ». Bravo pour la perspicacité de son regard et la rigueur de l’analyse : après toutes les forteresses Ehrenbreitstein dessinées et peintes depuis l’amont du fleuve, en voici enfin une de l’aval. Turner a souvent tenu à s’emparer de ses sujets de tous les côtés possibles, comme pour en épuiser les ressources picturales…En l’occurrence le « climat » de cette œuvre est totalement différent de celui de la série des Ehrenbreitstein connue jusqu’ici : la forteresse n’est plus qu’une « toile de fond » au bénéfice des premiers plans dans une succession de bleus qui composent (construisent) une atmosphère matinale inattendue pour le fleuve et sa vallée. This entry was posted on January 11, 2017 by Professor David Hill in Turner and tagged ehrenbreitstein, Germany, J.M.W.Turner, koblenz, neuendorf, Rhine, Turner, Turner Bequest.